Shonda Rhimes and TGIT stars Ellen Pompeo, Kerry Washington and Viola Davis voiced support for presidential candidate Hillary Clinton in a new ad that aired during “Grey’s Anatomy” on Thursday night. The 60-second spot, directed by “Scandal” star Tony Goldwyn, compares the Democratic contender to the “brilliant, complex, overqualified” female characters that lead ABC’s Shondaland dramas. I’m PROUD to say #ImWithHer. After saving a mother and child from a fiery car crash, McDreamy's car is t-boned by a tractor trailer. 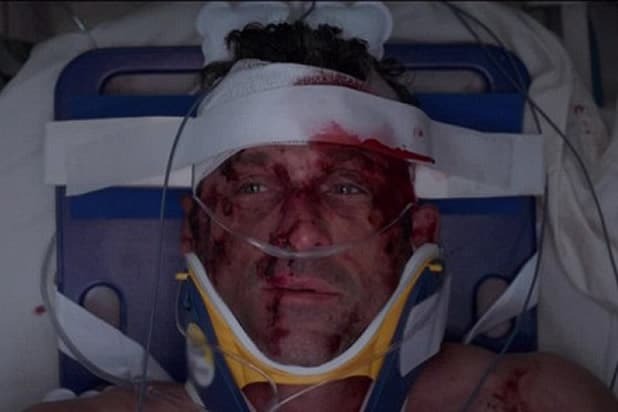 His brain injuries leave him brain-dead by the time Meredith (Ellen Pompeo) arrives. Denny proposes to Izzy (Katherine Heigl) just after his heart transplant, but the heart fails and he dies. In one of the most famously tragic moments in the series, Izzy lies in bed with him and sobs. The president's son is poisoned by order of Rowan Pope (Joe Morton) and dies in front of his family. For a while, though, the first family believes it was a suicide and spirals out of control. For the season finale cliffhanger, Rebecca is found dead in the basement, and only Annalise (Viola Davis) and Frank (Charlie Weber) know. It is later revealed that Bonnie (Liza Weil) suffocated her with a plastic bag out of loyalty to Annalise. A mentor to Cristina Yang (Sandra Oh) while she works at the Mayo Clinic in Minnesota, Dr. Thomas dies in the middle of performing surgery, leaving Cristina to finish the procedure on her own. On the day of his court date for illegally taking a man off of life support, Pete goes for a run and suffers a heart attack. He lies there dead all day until a police officer finds him. Lexie gets pinned under the wing of a plane after it crashes, crushing her lower body. She and Mark Sloan (Eric Dane) confess their love for each other and she dies on the scene. Fitz (Tony Goldwyn) comes to hospital bed of the Supreme Court justice and strangles her after she tells him the truth about how the shenanigans behind his election win. Conservative Vice President Sally Langston (Kate Burton) stabs her closeted gay husband, Daniel, in a fit of rage after he says he's leaving her. Lila's murderer is a mystery the entire first season until the last seconds of the finale. Frank Delfino (Charlie Weber), working on behalf of Sam Keating, is revealed as her killer, proving that he is literally the only person on this this show that could keep his cool long enough to actually get away with murder. In an effort to save a woman from being hit by a bus, George is dragged for blocks, making him unidentifiable at Seattle Grace when he's rushed in. Meredith (Ellen Pompeo) finds out his identity only when O'Malley traces "007" on her hand. Surviving the plane crash, Mark gets a last "surge" of energy and fills out a medical directive, giving him 30 days in a coma before he can be unplugged. Though his murder is previewed for the entire season, Sam's demise is more twisted than just a bloody killing. Law student Wes (Alfred Enoch) bashes him over the head with a trophy because he was attacking other members of the Keating 5 (not to mention he was cheating on Annalise with Lila and lying about it). Also Read: ‘How to Get Away With Murder’ Fans Take Over Twitter Asking #WhoKilledSam?